Warhol’s use of consumer items is nothing new, he was fascinated by consumer goods, and experimented with them throughout the 1960s. This is not the first time Warhol produced the soup cans, they were first exhibited six years earlier, as 32 canvases at the Ferus Gallery in Los Angeles. 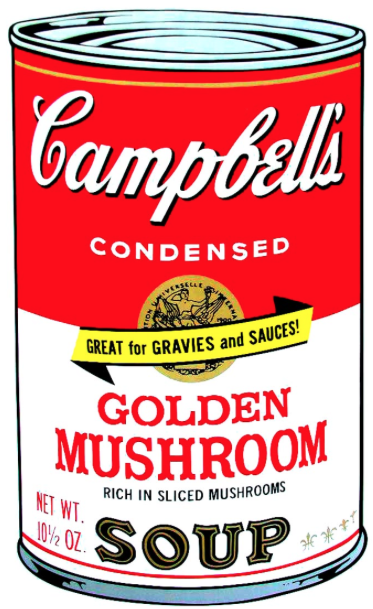 This image of the Golden Mushroom soup can is one of ten in Warhol’s “Campbell’s Soup II” portfolio. These classic images of the Campbell’s Soup cans are some of Warhol’s most iconic works. His use of black and white, and the strong red creates dynamic graphic imagery, which harks back to his graphic designer days, and creates a very eye-catching piece. Warhol’s use of consumer items is nothing new, he was fascinated by consumer goods, and experimented with them throughout the 1960s. This is not the first time Warhol produced the soup cans, they were first exhibited six years earlier, as 32 canvases at the Ferus Gallery in Los Angeles.